Let's get out there and take a look. July is mid-summer for us humans, and the time of year when we head out to our parks and beaches. However, despite the attractions of the season, it’s just not as pleasant and pretty down at the Deer Lake beach as it usually is. In fact, things are looking downright scruffy and untidy. All that feather shedding and goose pooping are making quite the mess. What’s going on? For sure it’s the birds making the mess, and over one hundred Canada Geese can make a good one, but before getting ticked off, spare them a sympathetic thought. 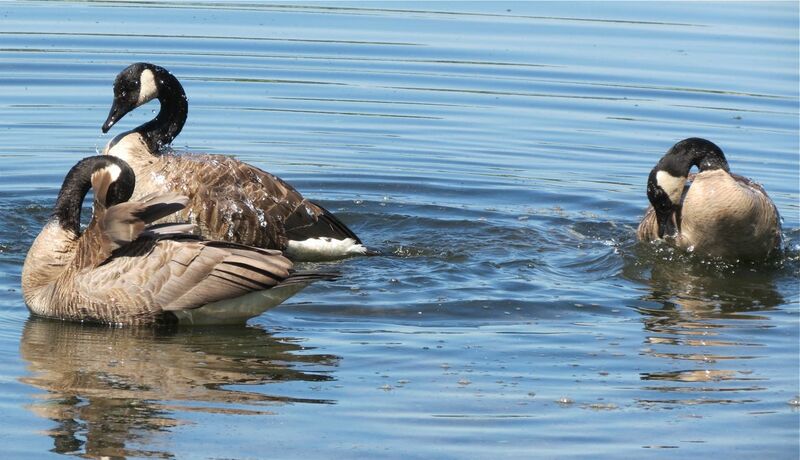 July is a pretty tough month to be a goose or a duck. They’re going through a big part of their annual moult. It’s biology and they have no choice. Walking around the beach, feathers are strewn everywhere and most of them are from the park’s ducks and geese. 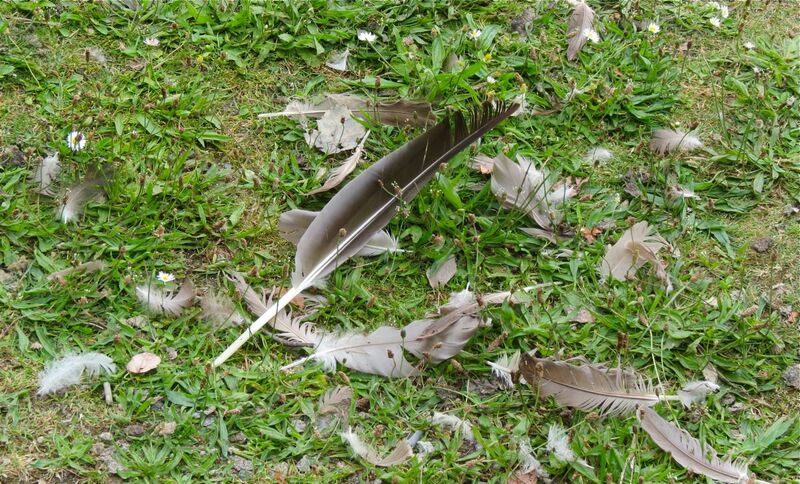 For all species of waterfowl (ducks, swans and geese), moulting is a pretty dramatic and stressful affair. Not only do they shed some of their body feathers, but also their wing feathers. And not just one by one; waterfowl lose their flight feathers all at once. Now if your flight feathers are gone, you’re flightless, and that can be serious – especially if you need to escape from a predator. So our ducks and geese gather in areas where they have easy access to an escape route – in this case to the lake itself. 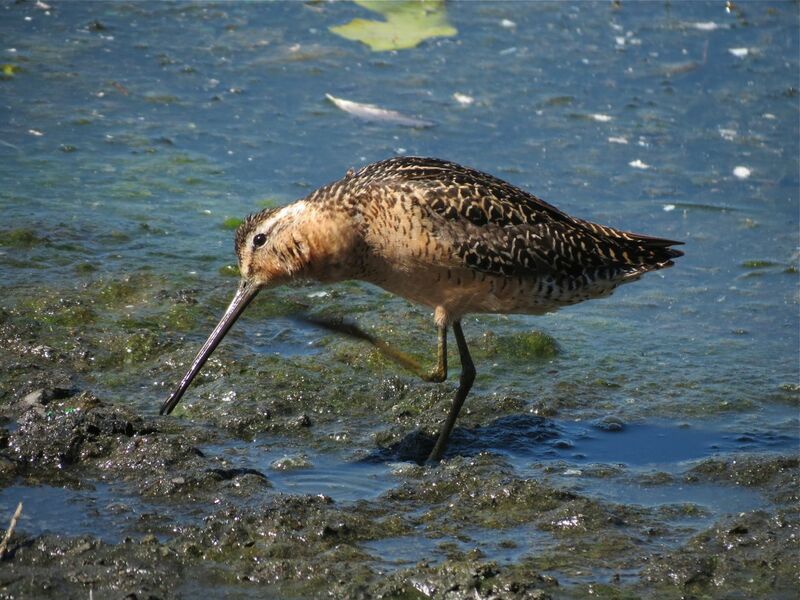 The beaches at Deer Lake and Piper Spit at Burnaby Lake offer great locations for moulting birds. Take a look at the goose above. The long, dark wing feathers that extend to the rear and partly cover the tail are completely missing and expose the black back and white rump that we see like this only at this time of year. Here’s another bird, and here you can see the newly growing pin feathers, or blood feathers as they are also called. Over a period of a couple of weeks they will become fully developed and fully functioning wing feathers, or primaries. Right now they’re just tiny stubs. The base of the pin feathers shown above are engorged with blood to aid their rapid growth. You can just see the new feather material emerging from the tip of the waxy coating. 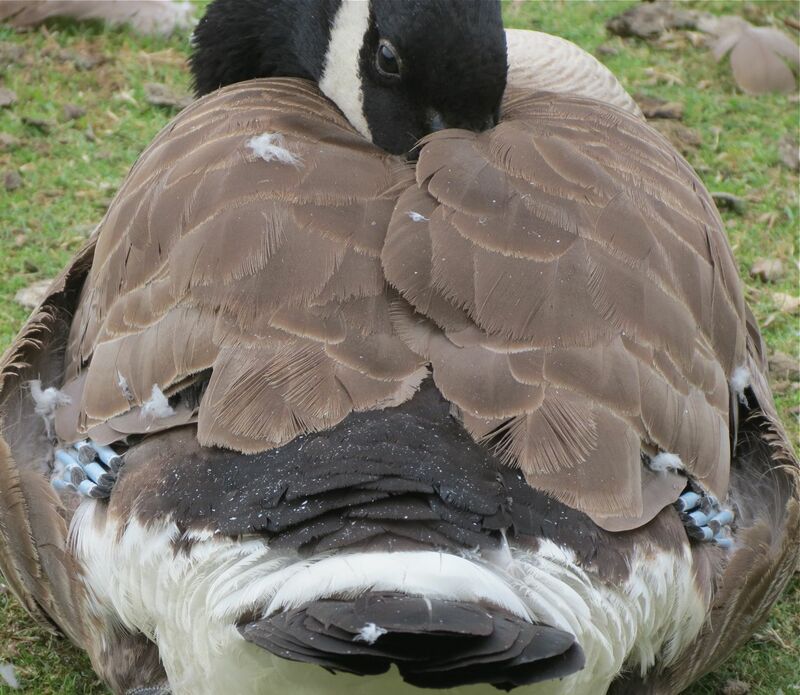 Damage to these pin feathers at this stage can be dangerous for the birds – it can lead to significant blood loss. A little further along in the moulting process, here’s a bird with partially-grown new flight feathers that have not yet reached their full length. The dark-coloured, newly growing flight feathers (primaries) are best seen on the bird’s left wing. Note the still-to-be-moulted, old, paler, worn-looking, unshed flight feather on the extreme lower left. As the flight feathers continue to grow they will once again cover the white rump and much of the tail. 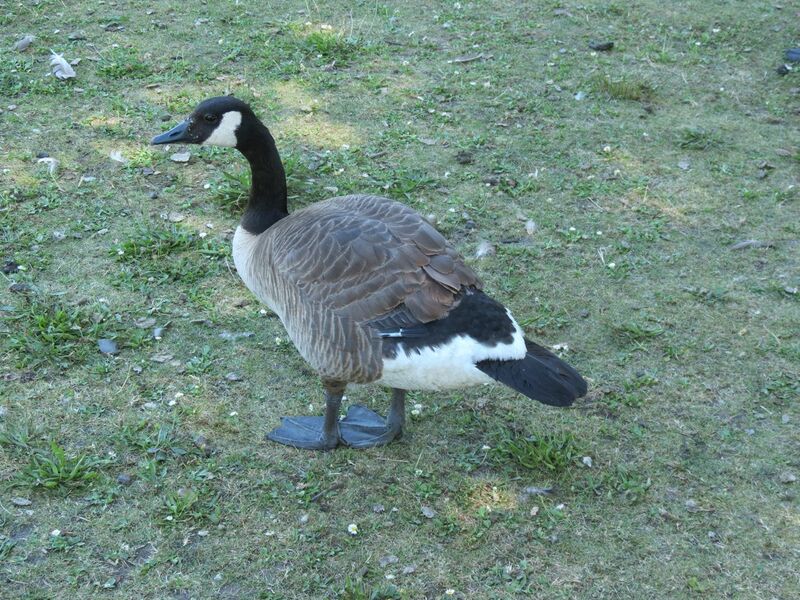 The bird above is also growing replacement tail feathers – note the uneven length at the tips. Growing so many large feathers at one time uses a lot of the birds’ energy, and they tend to loaf around to conserve it. Loafing on the beach, and then bathing in the lake. Remind you of anything? Loafing on the beach enables the moulting birds to bathe frequently and preen those new feathers into good condition. This is important work; they will have to last until this time next year before being replaced. 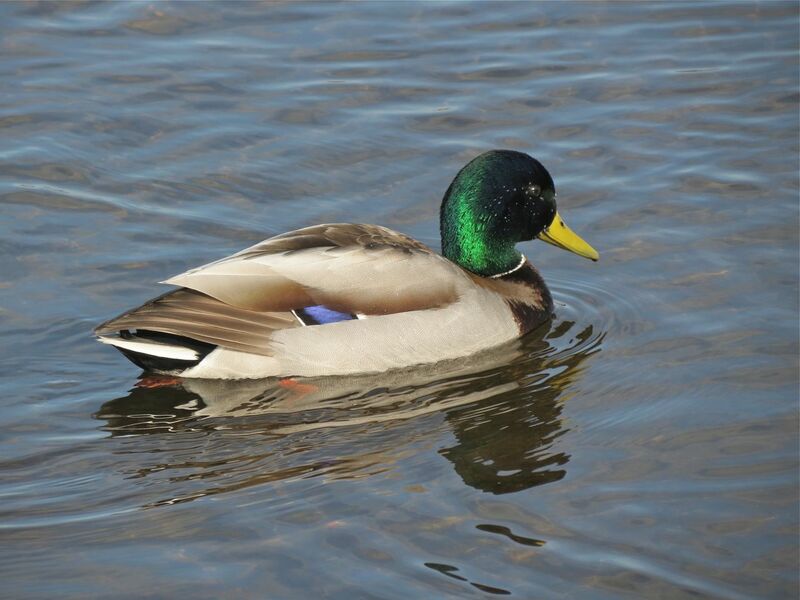 Ducks also moult their flight feathers after breeding, but their transformation is even more dramatic. As they moult their wing feathers, they enter what is known as eclipse plumage. The males loose all their fancy body feathering, and often look much the same as females of the species. However, given they are flightless, it’s no doubt best to be as inconspicuous as possible. Plus the fancy, female-attracting plumage is no longer required now that breeding has just finished. 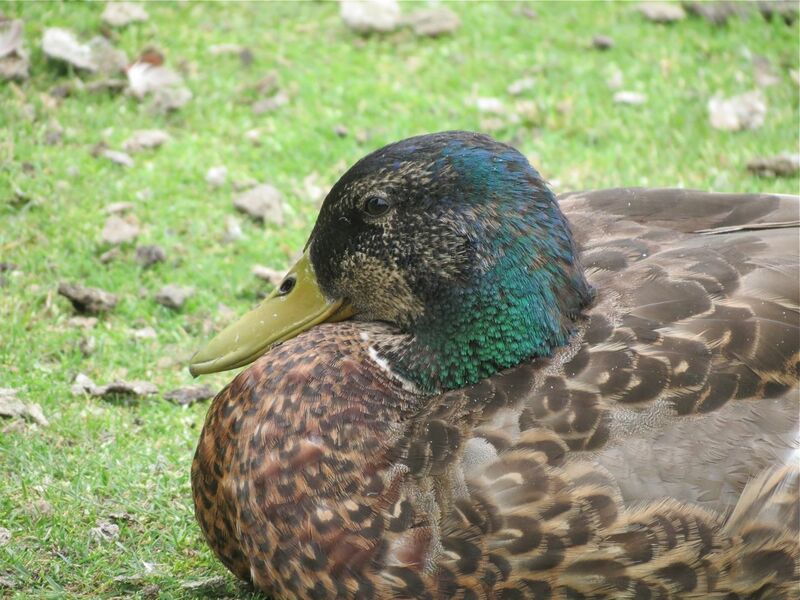 Here’s a picture taken earlier this year showing how much the drake Mallard transforms from eclipse to breeding plumage. Eclipse above, breeding below. 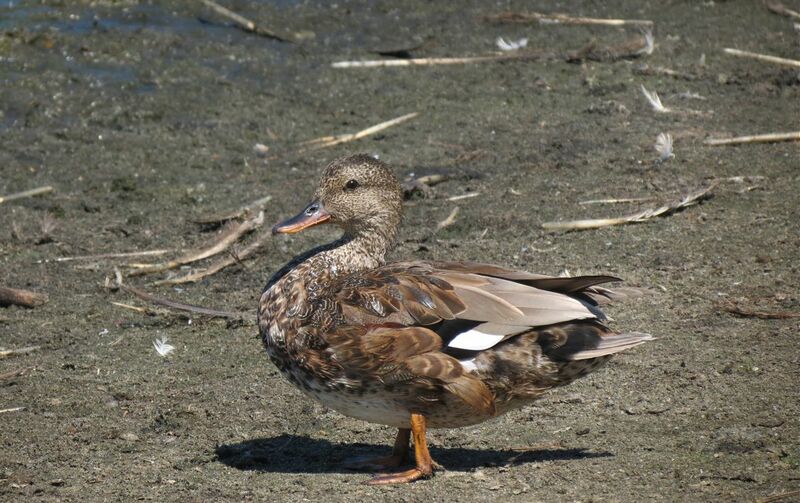 Ducks are very unusual in the bird world as the males have their two annual moults very close together in summer and fall. Most birds that take on different plumages for the breeding season have their second moult in the spring, ready for the breeding season. Ducks in contrast, form pairs in the winter and males develop their pre-breeding finery during fall to be ready for winter pre-breeding pairing. Lastly, here’s a very scruffy looking Gadwall at the lake. 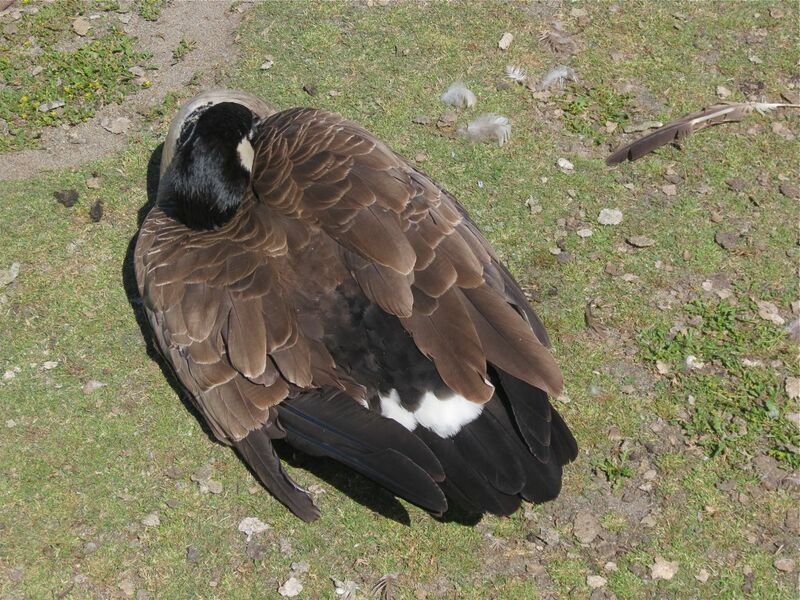 Along with moulting waterfowl, many other birds also undergo a moult at this time of year. 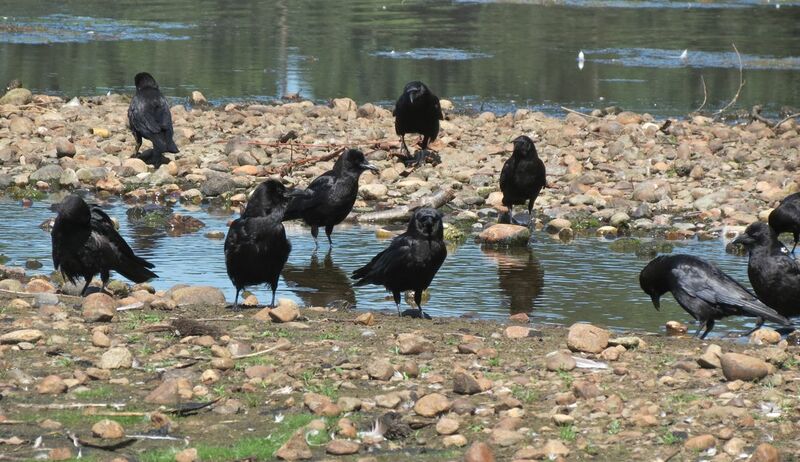 Just like our ducks and geese, even our crows come down to the beach to make use of the fresh water from Buckingham Creek to bathe and condition their new feathers. Unlike waterfowl, crows do not moult their flight feathers all at once, but lose and replace them serially over a period of several weeks. 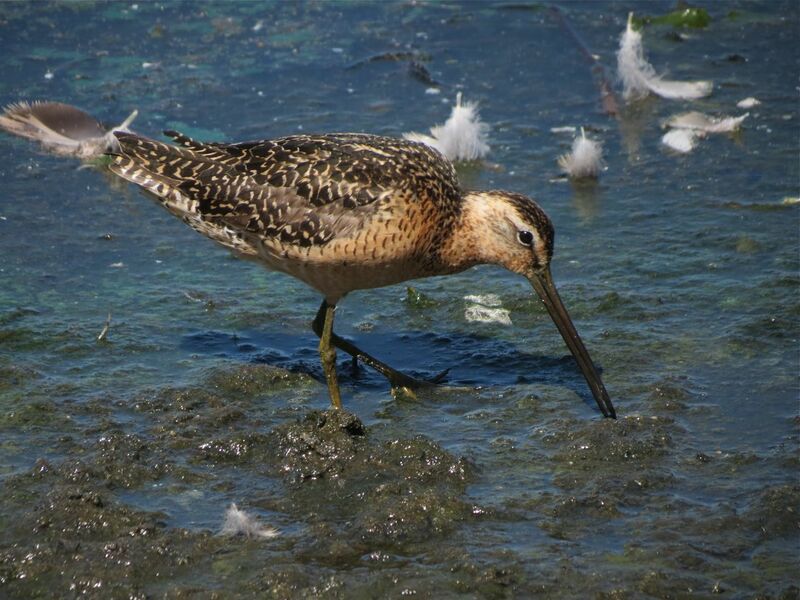 Such a moult strategy enables these birds to continue flying while undergoing this annual transformation. Looking up at crows flying overhead at this time of year you will notice the shape of the wings at the trailing edge is somewhat jagged, the result of new feathers growing in and others having been shed. The picture above is really illustrates what’s going on. 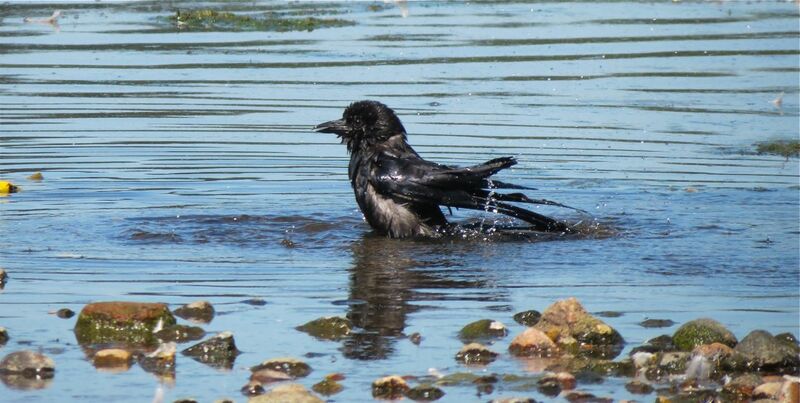 This Northwestern Crow photographed last week at Deer Lake shows both body and wing feathers being replaced. 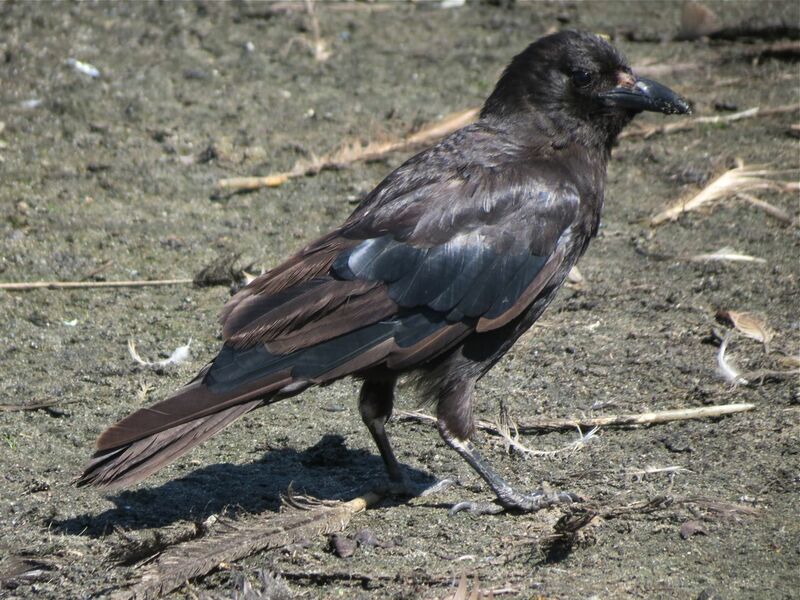 The old, sun-bleached, brownish feathers contrast quite strikingly with the glossy, black new feathers just growing in. This bird has also lost feathers at the base of the bill, likely as a result of continually stuffing food into the mouths of its hungry young. All will be restored to glossy glory in a few weeks. It’s enough to make you want to take a bath. 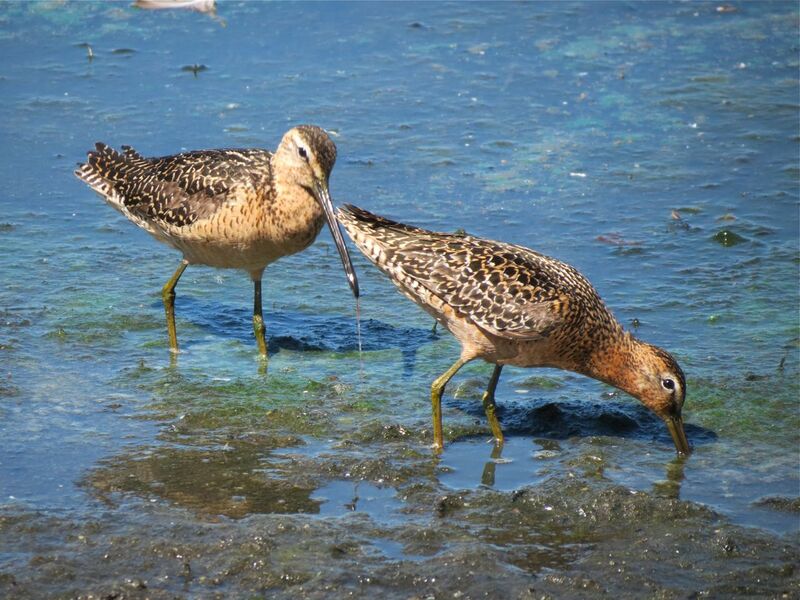 While photographing the geese, ducks and crows shown above, I suddenly noticed feeding right along the edge of the Deer Lake beach were these two Long-billed Dowitchers – a rare treat at this location. These two birds are adults in worn, breeding plumage. You’ll have to take my word on the “worn” part. Now these sandpipers have a different moulting strategy from the birds we’ve looked at so far. After breeding, the dowitchers migrate from the breeding grounds and then moult into their drabber winter plumage on the wintering grounds. 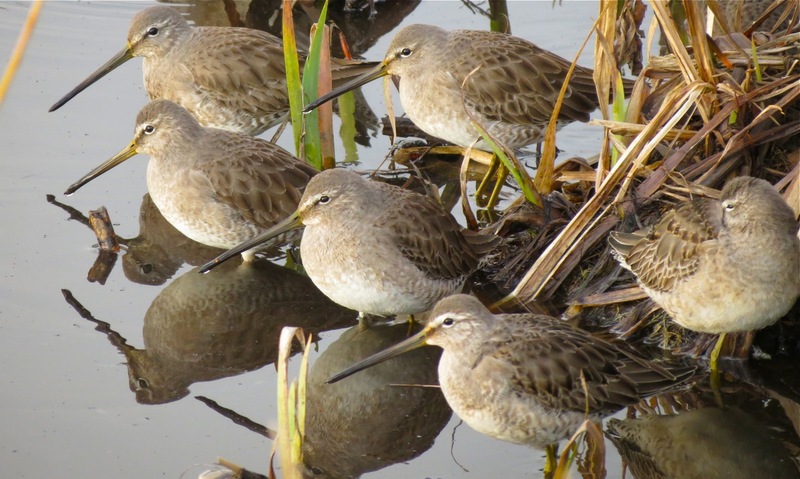 And many Long-billed Dowitchers spend the winter at Burnaby Lake. Here’s a picture from last winter. Look at the transformation. Breeding above, winter below. You can just see in the flanks of the bird below the first few hints of the greyer feathers of the winter plumage. With all this shedding of feathers and growing of new ones it’s enough to make you want to scratch that itch. It’s that time of year. It’s been a busy spring of birding and travel that has kept me away from the blog. However, it’s back, at least for a while.